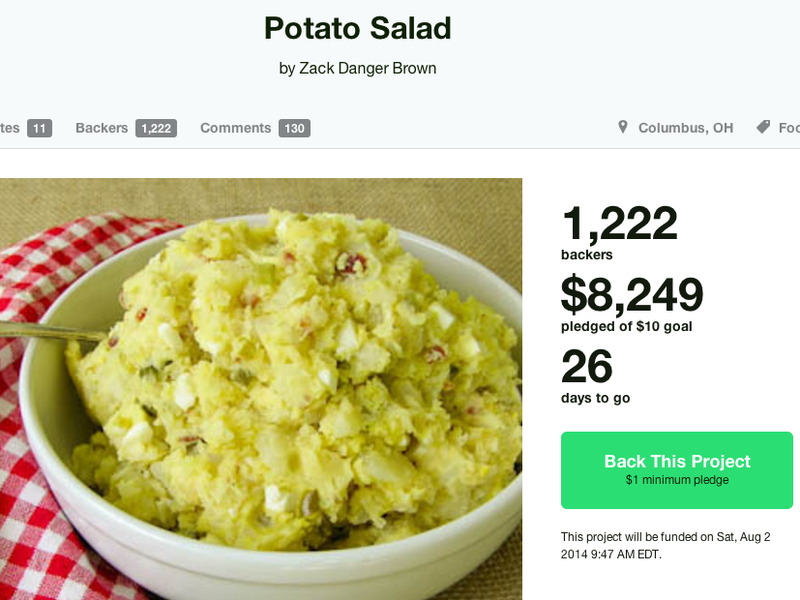 There’s a Kickstarter campaign underway to fund one man’s potato salad. And even though it sounds like a joke, it’s raking in serious cash. With over 1,000 enthusiastic backers, Brown, a web developer, has already raised over 900 times his original goal of $US10. The project, which started on July 3, doesn’t end until August. He’s already promised his backers four kinds of potato salad so far, including one vegan option. For a modest $US1, backers will get a “thank you” posted on Brown’s website, a picture of Brown making the potato salad (seriously), and Brown will say the backer’s name out loud while making the potato salad. For $US3, Brown will ship “a bite” of potato salad. For more generous donations, he’ll let you come hang out in his Columbus, Ohio kitchen while he makes the potato salad ($10), write you a potato salad haiku ($20), or send you a potato salad-themed hat ($25). Brown is raising money so fast, he’s having a hard time keeping up with making new stretch goals for his backers. At the $1,000 mark, he promised a live stream of the potato salad making process, and at $US3,000 he said he’d expand the potato salad making party out of his kitchen and rent out a party hall for all his $US10-and-up backers. 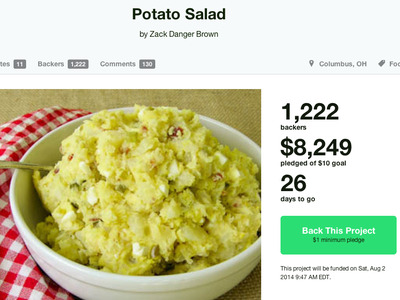 Kickstarter’s response to Brown’s potato salad project? “Inspiration takes many forms,” said Justin Kazmark, who works for Kickstarter’s communications team, in an email to Business Insider.